These three American dates served more or less as warm-up for the upcoming Tour Of The Tormentors MMVI. Actually within these gigs it could be said that the first two ones served as warm-up dates to the third one, Morrissey's appearance at the South By Southwest music festival in Austin. 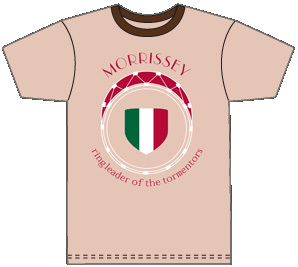 Morrissey debuted material from the upcoming and yet-to-be-released "Ringleader Of The Tormentors". There was a huge gong behind drummer Matt Walker with the word TORMENTORS on it in what seemed like peel-and-stick decals. The kick drum's resonant head was the Italian flag's tri-partite green, white, and red. Personnel: Boz Boorer - guitar; Jesse Tobias - guitar and occasional cymbals; Gary Day - bass; Michael Farrell - keyboards (also hits drum with mallet in "Life Is A Pigsty"); Matt Walker - drums. Morrissey also played the occasional maracas. Tiger Army on the first two dates. In Austin there was no opening band because Morrissey was booked at the South By Southwest Festival. Stinky Toys - "Boozy Creed"
Brian Eno - "Seven Deadly Finns"
Ramones - "Carbona Not Glue"
Olivia Newton-John - "Long Live Love"
New York Dolls - "Bad Detective"
Giorgio Gaber - "La Ballata Del Cerutti"
Ramones - "Why Is It Always This Way?" Monique Melsen - "Pomme, pomme, pomme"
The Boyfriends - "I Love You"
Smoking Popes - "You'll Never Walk Alone"
Morrissey then came on stage to Jobriath's "What A Pretty". Exit music after the concert was Frank Sinatra's "That's Life". 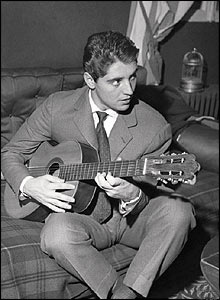 French singer Sacha Distel (view original or in situ). This was used only in Oklahoma City. In Tulsa there was no backdrop, perhaps because the stage was too small. The SXSW Festival in Austin could possibly not accommodate it. The setlist length for these three warm-up dates was of 19 songs in Tulsa, 18 in Oklahoma City and 17 in Austin. The new setlist featured six songs from the soon-to-be-released album "Ringleader Of The Tormentors": "You Have Killed Me", "The Youngest Was The Most Loved", "I Just Want To See The Boy Happy", "Life Is A Pigsty", "I Will See You In Far Off Places" and "At Last I Am Born". The lucky Tulsa audience were given a seventh one, "In The Future When All's Well". Most of the audience was obviously still unfamiliar with all this new material, so they were more excited by the selections from Morrissey's back catalogue. The biggest surprise was the live introduction of two Smiths-era songs never played before by Morrissey without the Smiths, "Still Ill" and "Girlfriend In A Coma". Actually the latter had never been performed by the Smiths either. The encore of "Stop Me If You Think You've Heard This One Before" on the two first dates was also almost new, it had never been performed by the Smiths, and only once by Morrissey in 1988 during a one-off gig in Wolverhampton. Previous album "You Are The Quarry" supplied its four singles, "Irish Blood, English Heart", "First Of The Gang To Die", "Let Me Kiss You" and "I Have Forgiven Jesus", and b-side "My Life Is A Succession Of People Saying Goodbye", available on that album's deluxe edition. 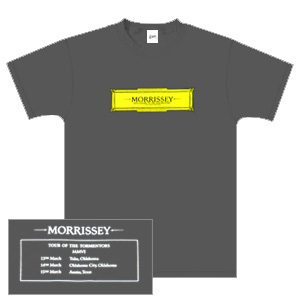 The only older material was, in reversed chronological order, "Trouble Loves Me" from 1997's "Maladjusted", "Reader Meet Author" from 1995's "Southpaw Grammar", the debut solo single "Suedehead" (except in Austin where it was dropped) and the Smiths-era "How Soon Is Now?" and "Last Night I Dreamt That Somebody Loved Me" (the encore in Austin), all previously performed in front of audiences. 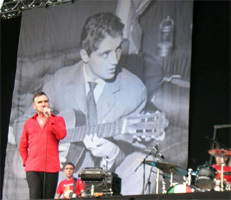 Morrissey constantly changed a line in "Still Ill" to "England's a swine and it owes me a living", and another to "and I should know because I see them very often". The newly introduced "Girlfriend In A Coma" was arranged for two guitars, giving the song a larger sound and more punch. Its final line was changed to "Let me whisper my final goodbye, I know it's serious". In "You Have Killed Me" Morrissey sometimes sang "Fellini you will never be" instead of "Magnani you'll never be". "Reader Meet Author" was adapted to the new century by the change of one line to "The year 2000, it hasn't changed anyone here", and Morrissey still sang "you hear the way this sad voice sings". Trumpet was added during the bridge of "Let Me Kiss You". In "I Will See You In Far Off Places" Morrissey changed lines to "It's so easy for us to be here together, but it's so hard for our flesh to combine" and the similar "It's so easy for us to stand together, but it's so hard for the flesh to combine". Morrissey made many minor lyrical changes in "Trouble Loves Me". He sang "somebody hold me" and "somebody kill me" instead of "otherwise hold me" and "otherwise kill me", and "which is only the way it should be" instead of "which is only as it should be". He also changed a line to "to chide me but never to guide me". But more importantly the song was always preceded by a different old-style piano intro of a well-known local song. See individual dates for details. In "Life Is A Pigsty" Morrissey usually replaced "I only live for you" with "I have lived only for you" or "I may live only for you", and "I'm falling in love again" with "I am in love again". In "At Last I Am Born" Morrissey sometimes changed the "vulgarians know" line to "vegetarians know". He made a previously unheard lyrical change in "Suedehead" when he sang "You had to sneak into my room just to play Your Arsenal, It was just to see, just to see all the songs you knew I'd written about you" and "...just to see, just to see all the crap you knew I'd written about you". He also did the previously heard change "still it was a good lay". In "Stop Me If You Think You've Heard This One Before", as for the only earlier performance of this song, Morrissey sang "so I drank one, or was it four?" He also sometimes sang "only slightly, only slightly more than I used to my love". There are no visual bootlegs of any date of this short leg of the Tour Of Tormentors MMVI in circulation at this point in time. The closest one might be interested in are digital video files of "Trouble Loves Me" and "Stop Me If You Think You've Heard This One Before" from the Oklahoma City show. There are recordings of all three of these warm-up shows in circulation at this point in time. The Tulsa and Austin recordings are the best, the latter is actually of excellent, near-soundboard quality. 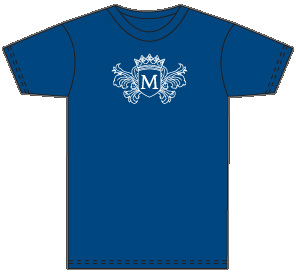 If one had to decide between those two, they might prefer Tulsa because it is one of only two sources for the 2006 live arrangement of "Suedehead". The recording of Oklahoma City also features the latter song, and although it is slightly boomy, it still sounds good. Completists will also be interested in a BBC radio broadcast of 7 songs from the Austin show. This will not be of interest much to non-completists given the quality of the audience recording of the complete concert mentioned above.